Sometimes we need to help people find the right words because they are so worried about finding the wrong ones. I had no idea how to deal with a miscarriage and found that the medical care I received generally seemed to down play my loss. I was never offered any support but after my 4th miscarriage I was told I should see a counsellor but that they could no longer offer this service on the NHS. I think that our western culture isn’t very good at dealing with loss or grief and I know at first I was looking to medical professionals to help me establish how serious my loss was and how to talk about it, which wasn’t a great idea as they were very clinical and matter of fact about it. It wasn’t until I eventually met some other people who had experienced similar losses that I realised I was grieving. It felt as though I had to learn a new language of how to talk about grief and how to express it. I also was offered some counselling sessions from a charity called PETALS and the counsellor there taught me how to grieve. My experience of recurrent miscarriage has been one of finding the courage to talk about struggle and loss, because I’ve found that it’s only in articulating and expressing my grief that I’ve been able to move forward and find hope and healing. I think miscarriage is becoming less of a taboo but it does still take a lot of courage to share your story. I also think it takes a lot of courage to hear someone’s story of loss and I think it’s important to support and provide information for those trying to support someone whose miscarried. I’ve lived in three different cities during my experience of recurrent miscarriage and the hospital care I have received has varied greatly. Now I am in Liverpool, it’s great having a centre that knows what they’re talking about and acknowledges the trauma I’ve been through. St Mary’s Paddington was great as well but I had to ask to be referred there as the care in Cambridge was so bad. I’ve had to grow a lot stronger in making sure my voice is heard with regards to my medical care and have had to research what care I’m entitled to. I’ve had to use PALS to get referred to St Mary’s Paddington after the clinic in Cambridge discharged me after my 6th miscarriage telling me they’d completed my case by recommending I had a Down’s screening test when I was next pregnant. I have found that I have had to be really proactive in finding the care and support I have needed to help me get through my miscarriages which is why charities like the Miscarriage Association are so great because the care is so varied across the country. The hardest thing for me over the past few years has been living with not having an answer as to why I’ve had so many miscarriages. There have been a lot of advances in the medical research of recurrent miscarriage but a lot of women still live without answers and it can be a difficult place to be. At the moment, I’m exploring what it means to live a meaningful life without children but it’s not easy and it’s not the life I thought I’d have. I felt that a big part of my story was this very secret thing. When I was going through my first four miscarriages I didn’t know anyone who had one and I had no idea how you were meant to deal with it. The way the doctor spoke to me, so matter of fact, it made me think it was just one of those things and I shouldn’t make a fuss. There were no guidelines so I felt I was crawling around in the dark, trying to find out what to do with it. With family, I tried to put on a brave face and show I was coping well and that I was strong. It was only on my fourth miscarriage, when I wasn’t coping so I knew I had to learn to talk about it. For me, it was a way of healing when I started to share what was happening with the people around me. Pregnancy and motherhood are big area of shame within women, if you have not been able to fulfil that role. Sharing your story gives you a point of connection with other people. As soon as I started talking about what happened so many people would share their own experiences of miscarriage. Miscarriage is such an isolating experience and then on top of it you feel you can’t talk about it at a time when you need support the most. I did counselling, but I was worried at first that if I start talking about it I would get so depressed but the counsellor told me by numbing myself it is more likely to lead to depression than sharing how I felt. I had to learn a lot about myself and that it is okay to struggle. From my experience, I have found it is important knowing who to talk to, you want to make sure you are in safe place and talking to safe people. You don’t want to expose yourself to negative messages as they just pile shame onto the story. One friend asked if I could tell her what it feels like because she doesn’t know, that was a very helpful approach. Writing the blog meant my experience went from being very private to very public. Over 10,000 people connected with the blog. I would receive emails from people who said they couldn’t speak to their family about what they were going through. It is such an isolating experience and I had to learn how to talk about it. Equally people sometimes need help in knowing how to speak about it to someone who has been affected. Sometimes we need to help people find the right words because they are so worried about finding the wrong ones. 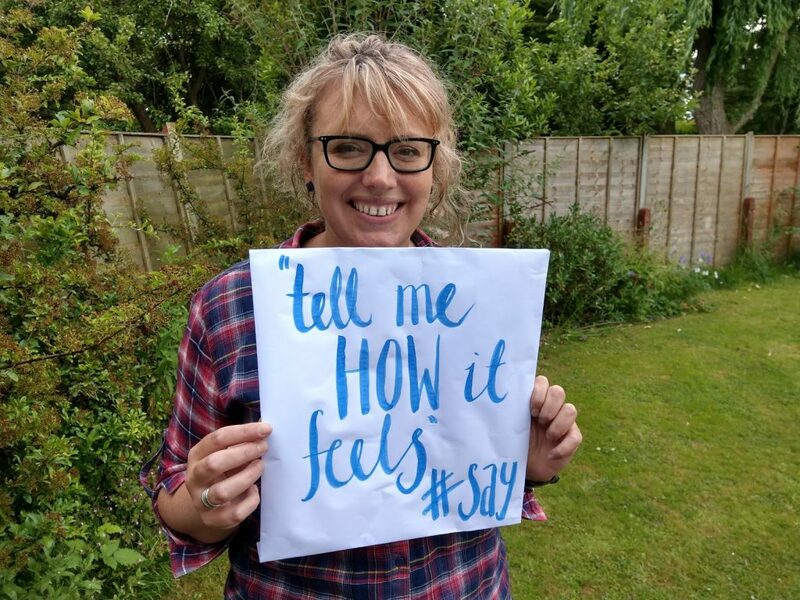 We need to get the message out that you don’t need to have experienced miscarriage or say some deeply insightful thing, you just need to be honest and ask them to tell you what they can do to help. The blog has given me a real sense of purpose. I want to help people know they are not alone in what they are feeling. It has taken me a long time to recover physically. Right now, it feels nice to have my body back and focus on helping others. Lizzie’s blog is Salt Water and Honey.